The last time I visited Calgary, my friends (who lived in the far south) wanted to pick me up from the airport (in the north). It was a weekday morning and both of them worked. After a minor debate and delay, the husband was nominated to get me since he didn’t start his shift till midday. I enjoyed the wait, because I saw people come and go, and I made up stories in my mind about who they were, where they were going, or who they were greeting. Most of all, I noticed a somewhat unkempt man who had made efforts to be presentable despite a seeming tendency to fray at the edges. He was carrying a small, modest bouquet of typical flowers, the kind that might have been purchased at Safeway. I wanted to tell him how sweet and wonderful he was, to bring flowers for someone he was meeting at the airport. His nervous eagerness shot out of his darting, seeking eyes, no doubt awaiting a fresh, new beloved. Perhaps it was an internet romance’s first face-to-face meeting. He was not young. He looked like he had already been trampled by a heartbreak or two. But his pacing was like a teenager who had never been kissed. He wasn’t quite sure how it was done, and he was long overdue for the experience. As I waited… and waited… I saw this bouquet-bearing lover’s forehead start to glisten over with sweat. Repeatedly checking the arrivals updates, his cell phone with no messages, he walked distances down the airport halls and back again. The bouquet was getting increasingly limp, flower heads facing the floor, as his shoulders began to hunch over, sadness setting in. About an hour after my arrival, I spotted my friend and rushed over to give him a hug. As we gabbed about the traffic and made our way out of the building, I took one more look back. The man was still there, head drooped, flower stems slipping from his grasp as he stood there, waiting… waiting. After a phenomenal spiritual experience in Portugal, I drove from Essex back ‘home’ to Wales. I re-discovered how much I love driving long distances, alone. A driving journey is to me a metaphor of a life journey; it’s a time of introspection. My travel companion Jacqui’s husband prepared me a CD of some random favourite songs to entertain along the way. Funny how just the right song is heard at the right moment: words that were once neutral, suddenly shout inspiration. I saw the sign for Tintern, and knew I had to go there. This impulse happened once before. The very first time I went to Wales was a weekend away in November 2001. My then partner Darren and I occasionally do the “Magical Mystery Tours”. We just point the car in a direction, and go, trusting we’ll find something worthwhile. Deep in the Wye Valley, we encountered hidden Tintern Abbey. I had a non-stop smile throughout the exploration of this place. It was Home. I knew it. Despite the dilapidation, I saw every inch of its original shape and use, and stated out loud what each area was used for, nearly a thousand years before. Darren, an utter skeptic, would confirm the truth of my statements by reading the historical information (which I avoided, feeling I knew better and in greater detail than did the historians). I saw where I had once lived, ate, shared with fellow monks. I sensed monks who still roamed and guarded this peaceful place. By the end of the visit, Darren’s face was rather white with shaken beliefs. I giggled in delight. As someone who senses the energy and history of places, this time, I had a personal connection. I still do not profess a belief in past lives, yet I knew I had lived here as a monk nearly a thousand years before. I had proof. Returning to where we lived in Essex at that time, I frequently ‘joked’ with Darren that I had brought back 5 monks with me. It was to deliberately tease, test, make him wonder. Said in jest, secretly, I did in fact sense 5 monks with me. The evidence of their presence manifested shortly after our return. Darren had poured himself a pint glass of cola. It ‘disappeared’. We hunted high and low in every room, even searching inside cupboards! A night and a day passed. Returning from work the second day, I asked Darren if he’d found the pint glass of cola yet. No. He’d looked that morning, too. In the kitchen, making one final round of checking, I challenged his skepticism. “If you find the glass now, will you become a believer?” Exasperated, he said, “Yes!”, but quickly, nervously laughed, unable to make that shift. He changed his answer to “no”. I walked into the the living room. There, plain and obvious as daylight, smack on eye level, was the intact pint glass full of cola. What can I say, but that this incident was the key to unlock the door to his closed mind. Wales nagged at me. I insisted we return for another weekend in August 2002. This confirmed to my gut where I needed to be. Darren, profusely resistent to ever living anywhere other than Essex, easily submitted. Four hours and a phone call after our return, destiny was set. Darren arranged a job transfer and I had 5 weeks to find a new residence in Wales. We had our mind set on Caerphilly. It had the best of all worlds. Easy access to work in Cardiff. Small town with all amenities, a castle and countryside. 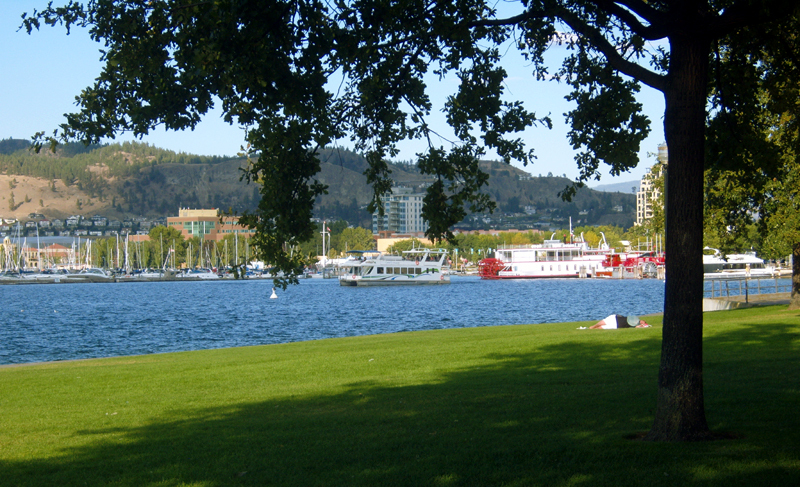 An idyllic setting. But no one would rent us a place to live. 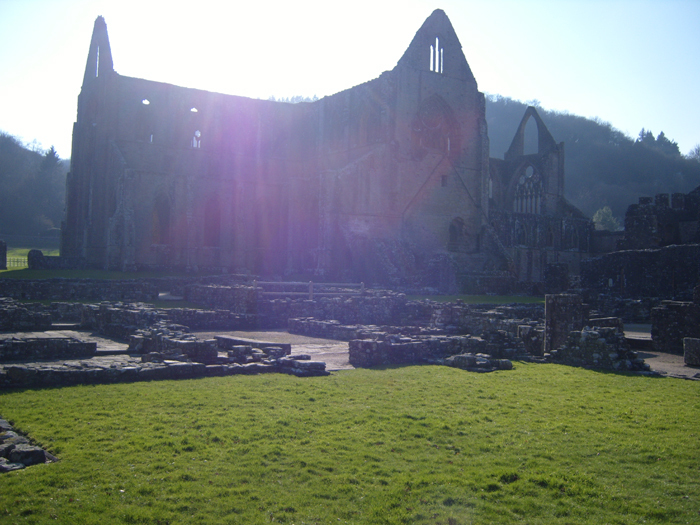 All these years not realizing the energy of the 5 monks were still with me, I returned them to Tintern. On an intellectual level, I understand how bizarre this may sound. Even to me, believing things I believe, open to all possibilities, it seems astounding. Yet, every moment of this experience was as real as anything I know to be ‘real’. 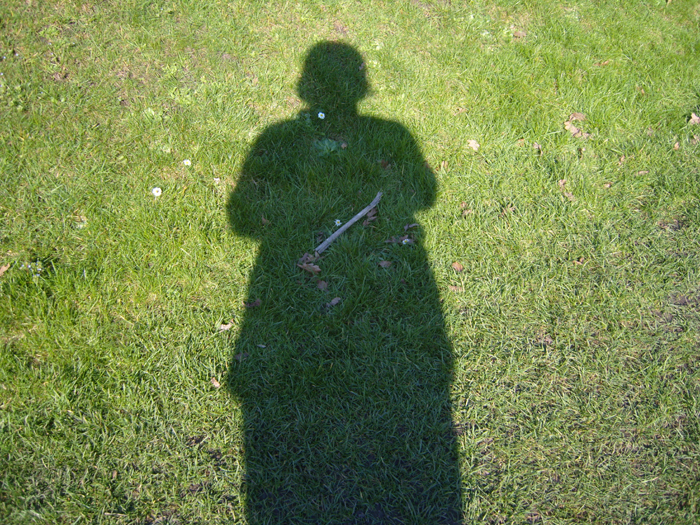 I recall taking numerous shots, including one of a shadow casting of myself on these grounds. All of a sudden, I heard the thundering noise of a spitfire coming at me. I took 1 photo of it as it approached, and another as it was directly overhead. 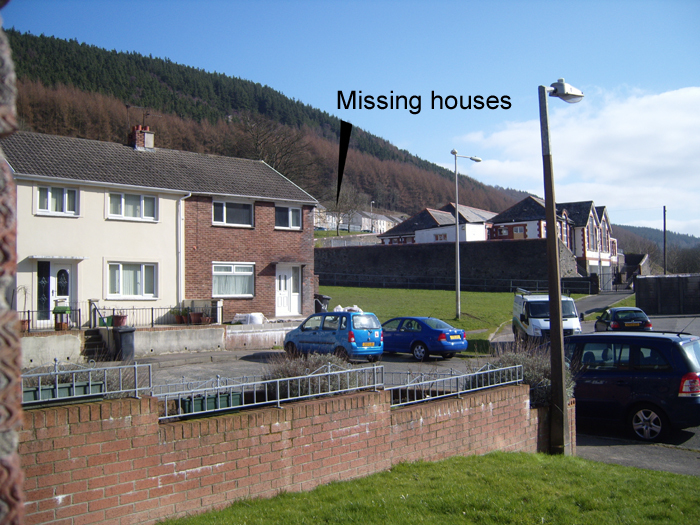 (More about this relevance in Why Merthyr Vale?). On my approach to the main part of the Abbey itself, strange things began happening with my camera. It made clicking noises, and beeped in a way I’d never heard it do. It would spontaneously shut off without warning, even though the battery indicator showed 2 out of 3 bars. Once inside the Abbey, the new set of batteries died. The camera continued to misbehave with the remaining 4. In fact, in some places, the camera simply would not register the shutter trigger. Pressing the button repeatedly, it refused to photograph, and very quickly, all 6 batteries were dead. Maybe it was a bad batch of batteries. But I interpreted this as the message that I was here, not to take pictures, but to perform closure on my ties to this place. I’ve been fascinated by the idea of human life karma. Not sure what I believe surrounding this, even still. But here, it was my truth. I sensed connection with the 5 monks, my brothers whom with I returned to this place. Me, in this body, them, in ethereal body. They sat as I explained that they have committed their ‘lives’ to protecting this place; but I, the 6th monk, have chosen to ‘move on’. I have ‘reincarnated’. I have a new mission. They were reluctant to let me go, but finally accepted my decision. They bid me a fond farewell, waving as I turned to leave. I looked back briefly at them, but immediately turned away again, to avoid the temptation of staying in a place where I had been so happy, in a life that had fulfilled me. I progressed to the open area where I ‘knew’ bodies were buried (though history appeared not to document) and acknowledged the unmarked graves of the 5 monks whose remains lay side by side. I, the sixth monk, had been exhumed. In my mind, the words repeated over and over: “I was exhumed, I was exhumed, I was exhumed…” as if I was trying to convince them of this fact. The exhumation was indication that my purpose at some point was no longer the same as the other 5. Even if this entire experience is simply a metaphor for my life, it is profound. Whatever attached me to Wales, I was now cutting ties with. I was acknowledging my emancipation. Moving to the next area, a place where the monks used to leisurely gather, I spotted a sign that drew out of me a frightened gasp: Novices. I sensed an anxious, frantic young male spirit, begging me to take him with me, to teach him what I know. I ignored his pleas and swiftly exited the ‘room’; but I ‘knew’ he was following. I tried to lose him, darting this way and that through ‘rooms’, to no avail. I realized that to ensure I was going to leave Tintern this time without any other spirit attachment, I’d have to return him to the Novices area. I re-entered where I had exited; he followed. I swiftly exited the other door of this room, guarded by the wisdom monks, leaving the novice in their capable hands. I slammed the ethereal door shut tight. I quickly cased my escape route, aware that the novice was still calling after me, shouting, reaching for me through windows. I ignored, and continued to dart toward the exit of the grounds in a random, untraceable way, energetically slamming and locking each doorway behind me. 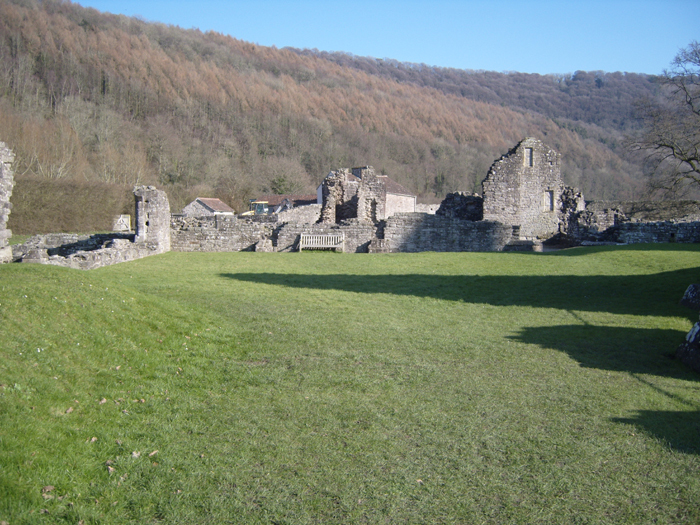 Exiting the grounds of Tintern Abbey, I knew that I could never go back here, not in this life, not ever. My job is done. Using the washroom beyond the final gate, I saw 2 exit doors. The one through which I entered the washroom and was about to exit, and another right next to it at a perpendicular angle. On that second door was a long, blatant, warning sign saying: “This Door Must Be Kept Locked At All Times”. Thus, I have closed the door on Tintern Abbey.